THERE is a law that prohibits the entry of members of political dynasties into the Sangguniang Kabataan (SK), and the Commission on Elections (Comelec) is implementing it for the first time in Philippine history in the May 2018 elections. Signed into law in January 2016, the SK Reform Act would have been implemented in 2017, but the SK elections were postponed. Filing of certificates of candidacies for this year's SK began on April 14 and will end on April 20. Unlike the ban on political dynasties proposed by the Consultative Committee reviewing the 1987 Constitution, the SK Reform Act applies only to SK candidates. The commmittee's proposal seeks a nationwide ban on all elective and appointive positions. This early, the Comelec is keeping an eye on possible violators of the law. Voters will put into office eight SK officials, including a chairperson, in at least 40,000 barangays nationwide. "(When) they (SK candidates) file their certificates of candidacy, there is a declaration that they are not related up to the second civil degree to any incumbent, elected government official," Comelec spokesperson James Jimenez told ANC on Tuesday morning. "It's a declaration under oath so if they're found out they can be disqualified and they'll have problems with the fact that they lied under oath," Jimenez said. Sen. Bam Aquino, co-author of the SK Reform Act, said the measure was meant to address perpetual complaints of emerging youth leaders against potential rivals belonging to political clans. "Ang batikos ng maraming youth leaders, hindi sila makatakbo o makapasok dahil karamihan ng nananalo o sinusuportahan ng barangay ay iyung kamag-anak din ng barangay officials o mayor," he said. Under the law, an individual can't seek election or be appointed to any position in the SK if his or her parents, siblings, grandparents, spouse, mother-in-law, father-in-law, sister-in-law, brother-in-law, grandmother-in-law, or grandfather-in-law is an incumbent elected national official. Neither can he or she run or be appointed if any of the same relatives is an incumbent elected official in the province, city, municipality or barangay he or she wishes to serve. The ban extends to the regional level in the Autonomous Region in Muslim Mindanao and the Cordillera Administrative Region. Aquino said the anti-dynasty provision was included in the law to shield young leaders from the influence of relatives in public office. "Dapat yung kabataan ang nagde-decide kung paano yung pondo nagagamit. Dahil may familial relations, yung independence na iyon nawala," he said. "Yung nasunod ay yung gusto ng ibang opisyal, hindi yung gusto ng kabataan." The law is not as far-reaching as the proposal of the committee led by former Chief Justice Reynato Puno. Still, an anti-political dynasty advocate called it a milestone. "It's a very important beginning for a set of reforms we haven't seen in thirty years or more," said Dean Ronald Mendoza of the Ateneo School of Government. "This will open the door for many young new leaders. Instead of going abroad or not serving because they're so disillusioned, they can put their money where their mouth is. If you want change, now is the chance. We've opened up space for you," he said. An ongoing study led by Mendoza at the Ateneo Policy Centre showed that based on data in 2010, the last time SK elections were held, political dynasties had infiltrated the SK level in at least five provinces. 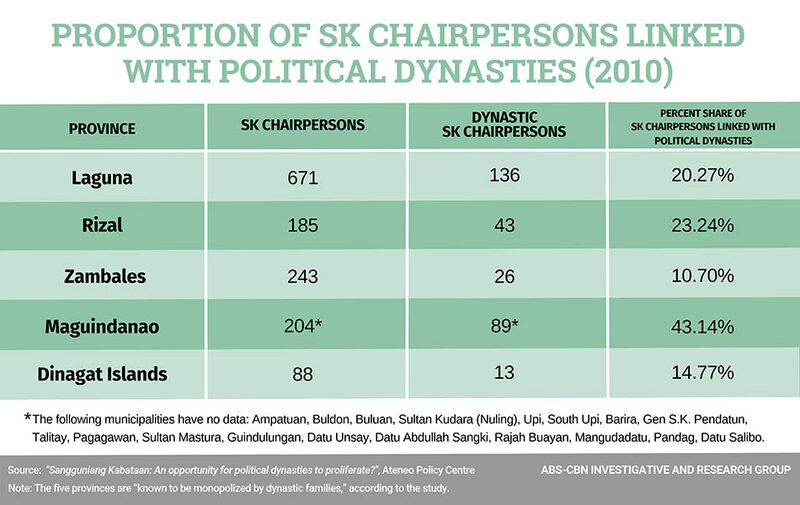 In Maguindanao, available data showed forty-three percent of SK Chairpersons had links to political dynasties. Twenty three percent were dynastic in Rizal and fifteen percent in Dinagat Islands. "The culture we have created for politics in our country is so personality and clan driven," Mendoza said. "We associate public services and public goods with personalities and political families when in fact it is citizens who pay taxes and undergo collective action who bring about meaningful change," he said. 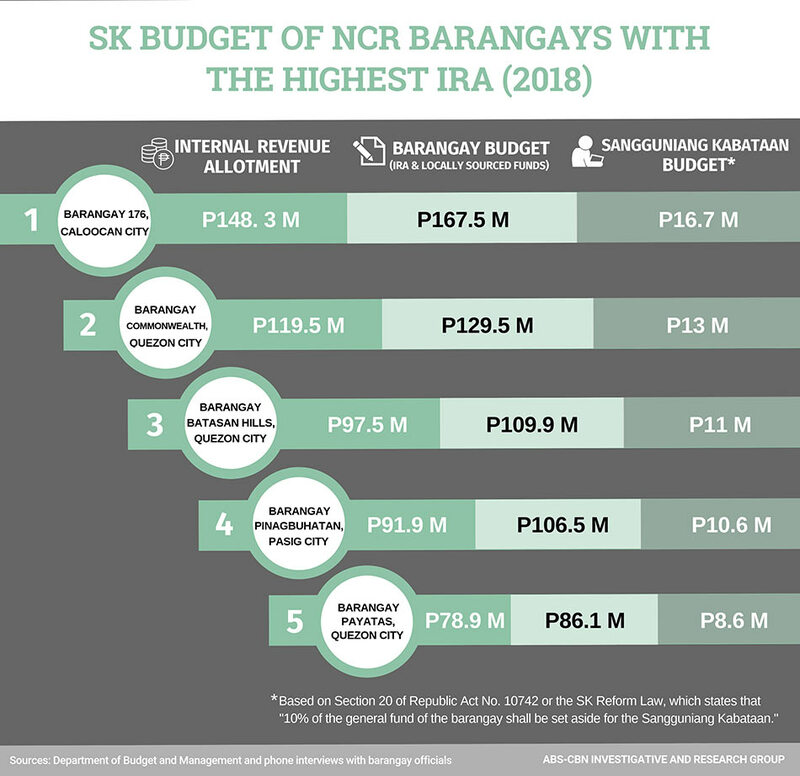 The annual SK budget is 10 percent of the baranggay appropriations where it is located, and in some cases, amounts to millions of pesos. "Huwag lang sana ma-limit sa pa-liga at sports. That's important, but you'll find marami pang ibang problema, like education, employment, health issues and reproductive health issues," Aquino said. In Baranggay San Antonio, San Pedro, Laguna, where 20 percent of the SK chairpersons elected in 2010 had ties with political clans, the SK budget for 2018 is P5.4 million, a hefty sum that many young people have not likely handled before. As youth volunteers of Adelina-1 subdivision converged at the gym one Friday afternoon in April for cleaning and greening activities, they bounced off ideas as to how the SK budget ought to be spent. "Maraming mga batang nangangalakal ng basura dito, bakit hindi yun ang pagtuunan ng pansin?" said Adrian Aluning. "Parang mas gusto kong madagdagan yung scholars, lalo na para sa mga kabataang walang kakayahang pag-aralin ng kanilang magulang," said Princess Ana. Another youth volunteer, Christian Marcorde, said sports programs were important, but pointed out that activities should be organized for both men and women. "Tuwing summer lagi na lang basketball league ang nangyayari. Bakit di naman gumawa ng tournament para sa mga babae, tulad ng volleyball?" Unfortunately, the three volunteers, all 17 years old, are not eligible to run in the upcoming elections. But they can certainly vote in the SK elections as the voting age is 15 to 30 years old. The SK Reform Act pegged the age of candidates from 18 to 24 years old. Previously, individuals aged 15 to 18 years old could run for office. Over 20.6 million Filipinos, or 67 percent of an estimated 30.8 million Filipinos aged 15 to 30 are registered voters of the Katipunan ng Kabataan, according to the Comelec. Senator Aquino called amendments made to the age of candidates "one of the best reforms" in the SK Reform law. When SK officials were under 18, they couldn't sign documents or open bank accounts, he said. "Yung edad had that technical problem but also, based on our experience, youth leaders who are active and can stand up and fight (for their beliefs) if need be, are already in college or older." The law also mandates that all newly elected SK officials undergo training that, Aquino said, will enable them to find new solutions to problems that have long plagued the youth. And they will be mandated to consult youth leaders from other sectors like the church, schools and non-government organizations when planning and implementing programs. In all, Aquino said the law seeks greater participation of ordinary Filipinos in local governance. "Excited kaming makita ang bagong mukha ng SK. Sana we get it right this time and hindi na bumalik yung batikos na nagiging breeding ground lang yan for traditional politicians."